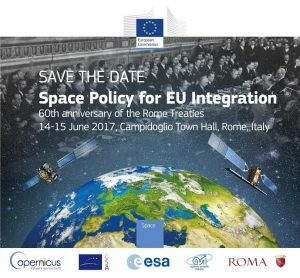 On the occasion of the 60th anniversary of the Rome Treaties, European Commission organises the “Space Policy for EU Integration” high-level event, to be held in Rome on 14-15 June 2017. The opening ceremony will take place at “La Lanterna di Fuksas” (Via Tomacelli, 156, Roma), starting at 18:45 on 14 June, with the presentation of the first Sentinel 2B images while the celebration itself will be held on 15 June at the Campidoglio Town Hall (Piazza del Campidoglio, Roma) from 09:00 to 12:45. 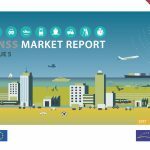 The agenda foresees a Keynote Speech by Commissioner Bieńkowska, and the presence of the President of the European Parliament, representatives of the Italian Government, DG GROW, Copernicus Entrusted Entities, European networks and stakeholders’ associations, ESA, the Italian Space Agency (ASI), Industry, and end-users. The participation in the event is on personal invitation. The submission of this form does not imply an automatic registration. The confirmation will be communicated to you through a second email sent by the organisers of the event..